Using cutting-edge satellite and acoustic technology, a researcher from Florida Atlantic University's Harbor Branch Oceanographic Institute is among a team of scientists who are the first to confirm the movement patterns and seasonal migrations of baby white sharks in the north Atlantic Ocean. Until now, there has been little information on their habitat during this vulnerable early stage of life. Baby white sharks have frequently been observed in the New York Bight along the Atlantic coast of the United States from Cape May Inlet in New Jersey to Montauk Point on the eastern tip of Long Island, New York. Scientists believe that the New York Bight may serve an important "nursery" role off Long Island. However, for an area to be considered a shark nursery, data must show that baby sharks are more frequently encountered in the area as compared to other areas; that they use the area repeatedly over years; and that they demonstrate residency within the area for extended periods. For the New York Bight, scientists have only been able to prove the first two criteria, and many basic questions about baby white sharks' distribution, movements, and habitat-use have remained unanswered. In a study published in Scientific Reports, Matt Ajemian, Ph.D., an assistant research professor at FAU's Harbor Branch and a former Long Island resident, and collaborators from the National Oceanic and Atmospheric Administration's (NOAA) National Marine Fisheries, OCEARCH and others, put the New York Bight shark nursery theory to test by deploying satellite and acoustic tags on 10 baby white sharks (less than 1 year old) off Long Island's coast. Their habitat use was monitored and characterized based on bathymetry, sea surface temperature, and distance from shore. In the late fall, the tagged baby white sharks headed southward, overwintering in a habitat the scientists identified off North and South Carolinas' shelf waters. By December, all of the baby white sharks were located off the Carolinas, with a focal area off the Outer Banks north of Cape Hatteras. In spring, several of the tagged baby white sharks returned to the New York Bight. 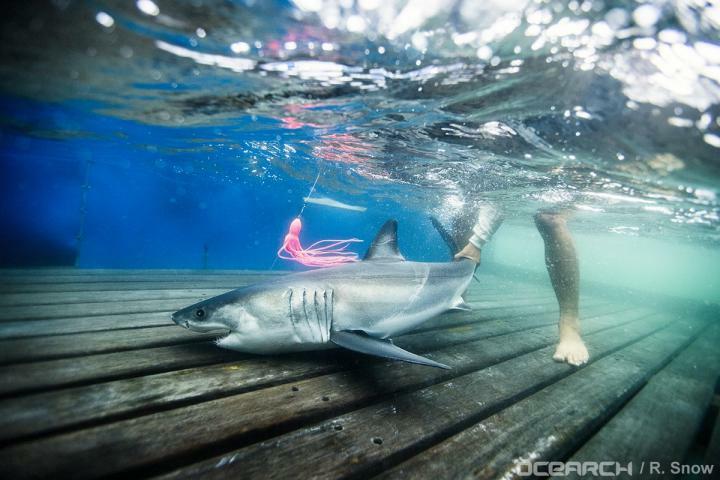 For the study, on average, the baby white sharks were tracked for about 111 days. "It is vital that these baby white sharks reach maturity to ensure a stable and abundant future for this important apex predator," said Ajemian, who has observed and encountered great white sharks closer to home in Florida this past year. "The multi-tagging approach that we used provides us with a 4D view of their habitats in space and time that will help us to monitor and manage this critically important species." "The battery life of the acoustic tags we used will last up to 10 years and will have a sustained acoustic monitoring infrastructure along the U.S. east coast," said Mike McCallister, a research coordinator at FAU's Harbor Branch, who works with Ajemian and tagged the majority of the sharks on the expedition. "This important technology will provide us with the opportunity to observe changes in white shark distribution, habitat use, and migration over the life span of this species from infant to large juvenile age classes." "Fisheries and ocean resources managers can use information from our study to better assess the impacts of human activities on these baby white sharks and their habitats," said Ajemian. "While considered less of a potential threat than overfishing, coastal habitat degradation and possible habitat modification from ocean energy development activities also can be assessed with this new information." Argos satellite tag positions used in this study are archived and publicly viewable on the OCEARCH Global Shark Tracker website: http://www.ocearch.org. Other collaborators on the study, "First Insights into Movements of Young-of-the-year White Sharks (Carcharodon carcharias) in the Western North Atlantic Ocean," are Southampton High School in New York, New Jersey Institute of Technology, and South Fork Natural History Museum in New York.